We offer different types of pavers. We’ve got bergerac circle/regular, cambridge regular/tumbled, cambridge square regular/tumbled, Celtic siding/cap, Dublin circle/combo/modular, Holland, mega bergerac, mega bergerac large square, radian caps, and turfstone. All available for pick-up or delivery and sold by the piece or by the pallet. 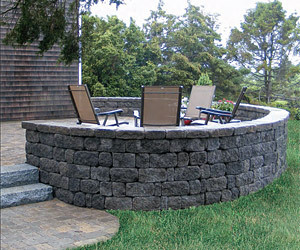 There are many uses for the Radian caps but the largest usage is for walls, steps and fire pits. Let our design team construct the great backyard you have always wanted. Contact us today at Orlando Outdoors!